The time is the 1950s, when life was simpler, people still believed in dreams, and family was, very nearly, everything. The place is a small midwestern town with a high school and a downtown, a skating pond and a movie house. And on a tree-lined street in the heartland of America, an extraordinary set of events begins to unfold. And gradually what seems serendipitous is tinged with purpose. A happy home is shattered by a child's senseless death. A loving marriage starts to unravel. And a stranger arrives—a young woman who will touch many lives before she moves on. She and a young man will meet and fall in love. Their love, so innocent and full of hope, helps to restore a family's dreams. And all of their lives will be changed forever by the precious gift she leaves them. 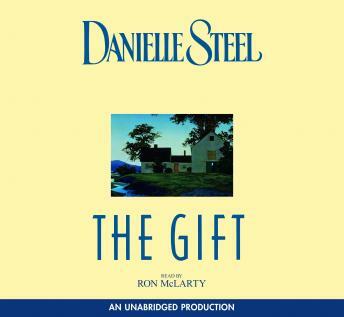 The Gift, Danielle Steel's thirty-third best-selling work, is a magical story told with stunning simplicity and power. It reveals a relationship so moving it will take your breath away. And it tells a haunting and beautiful truth about the unpredictability—and the wonder—of life. A bit syrupy even for Danielle Steel but worth a listen with some comfort food if you're in the mood!! This was a nice feel good story. Typical Steele. It has a mixture of heartbreak, lost and found happiness, tinged with a lesson in morality and the reader is left knowing that eventually all things can turn-out right. A nice warm book for long commutes.